David S. Stephens, MD, is the Chair of the Department of Medicine and the Stephen W. Schwarzmann Distinguished Professor of Medicine. He is also Vice President for Research in the Robert W. Woodruff Health Sciences Center (WHSC), a position in which he oversees the WHSC research enterprise and leads planning activities that enhance research programs and collaborations throughout the WHSC and Emory University. Dr. Stephens joined the Emory Department of Medicine faculty in 1982 and was named Director of the Division of Infectious Diseases in 1992. He served in that role until 2013 and led the development of very successful programs in infectious diseases and microbial pathogenesis. He has been a major contributor to the creation and development of the NIH-funded Emory Vaccine Center, the Emory Center for AIDS Research (CFAR) and the Serious Communicable Diseases Unit (SCDU) at Emory. He served as the founding principal investigator for NIH-fundedAtlanta's Clinical and Translational Science Award (CTSA), a multi-institutional research and clinical trials partnership funded (2007), refunded (2012) and in (2017) funded as the expanded Georgia Clinical and Translational Research Alliance (GaCTSA). Dr. Stephens has led research initiatives in the School of Medicine (Executive Associate Dean 2005-2008) and as the Vice President of Research (2008-present). Researchers at Emory University received $628 million from external funding agencies in fiscal year 2017. This marks the eighth consecutive year that extramural research funding has exceeded $500 million. Researchers in Emory's WHSC received $585 million in FY17, with $354 million in federal funding, including more than $307 million from the NIH. Examples of recent successful research initiatives in WHSC include NIH recognition of the Winship Cancer Institute as a comprehensive cancer center, NIAID support of the Emory Transplant Center, HHS support of the National Ebola Training and Education Center, the health services research initiative-Health Innovation Program, the Emory-Ga Tech immuno-engineering initiative, the regenerative medicine (REM) program with Ga Tech and UGA, the Emory-Children’s Pediatrics Center and the Queensland Emory Development (QED) Alliance. Dr. Stephens is professor of microbiology and immunology in the School of Medicine and professor of epidemiology at Emory's Rollins School of Public Health. He is chair of the Research Advisory Council in the WHSC and a member of the Executive Committee on the WHSC Leadership Team. After receiving his MD degree from Wake Forest University School of Medicine, Dr. Stephens conducted research at Walter Reed Army Medical Center and the National Institutes of Health (NIH). He completed his clinical training in internal medicine and infectious diseases and a research fellowship in microbial pathogenesis at Vanderbilt University School of Medicine. His laboratory is an international leader in efforts to define the molecular basis for the virulence of and vaccines to prevent bacterial meningitis, especially disease caused by Neisseria meningitidis and Streptoccous pneumoniae. He has contributed to more than 300 publications in infectious diseases, molecular pathogenesis, epidemiology, vaccinology and immunology. Dr. Stephens is a member of the Association of American Physicians and the American Academy of Microbiology, and is a Fellow of the Infectious Diseases Society of America, the American College of Physicians, and the American Association for the Advancement of Science. He has served on NIH, Veterans Affairs, Centers for Disease Control and Prevention (CDC) and Food and Drug Administration (FDA) review panels. He was chair of the FDA National Vaccine Advisory Committee, a liaison member of the Health and Human Services National Vaccine Advisory Committee and has served as a Senior Scientific Consultant to the CDC Meningitis and Special Pathogens Branch. He is currently serving as a member of the HHS/CDCNational Advisory Committee on Immunization Practices (ACIP), and chairs the ACIP Meningococcal Work Group and Anthrax Vaccine Work Group. In 1988 Dr. Stephens co-founded the Atlanta Active Surveillance Project (now the Georgia Emerging Infections Programs), a population-based surveillance and clinical research program. In 2001 he led CDC's clinical emergency response team in defining clinical issues in prophylaxis, diagnosis and treatment of Bacillus anthracis infections and has contributed to efforts to combat other infectious diseases threats such as epidemic meningitis, SARS and recently Ebola viral disease. Dr. Stephens has served as the site principal investigator for multiple NIH RO1 and other federal grants including the NIH-sponsored Southeastern Regional Center of Excellence for Emerging Infections and Biodefense, the CDC-supported Southeastern Center for Emerging Biologic Threats, and the NIH-funded Exploratory Center for Interdisciplinary Research in Vaccinology. He founded and directed the Emory University NIH K30 Clinical Research Curriculum Award (now a component of the CTSA) and previously served as the interim chair and executive vice chair of the Department of Medicine at Emory. From 2016-2017, he served as the Interim Dean of the Emory University School of Medicine. The infectious diseases program he helped develop has graduated more than 150 fellows, and his laboratory has trained over 90 infectious diseases fellows, postdoctoral fellows, medical students and undergraduates in bacterial pathogenesis. He has served as the thesis advisor for nine PhD, MS or MPH degree candidates and has served on over 30 PhD graduate committees in microbiology and molecular genetics, immunology and epidemiology. 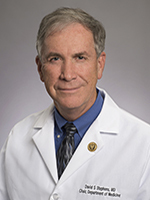 He serves as Chief of Medicine of Emory Healthcare and rounded for thirty years in infectious diseases and medicine at Grady Memorial Hospital and the Atlanta VA Medical Center.